MADRIX can control DVI-based LED products. DVI output is particularly useful when using a video beamer [VGA or DVI, for example], a DVI video wall, the software LED Studio, on-screen capturing, or in similar fields of application. ▪ MADRIX KEY dvi start supports up to 512 native DVI pixels, for example 32x16 pixels. ▪ MADRIX KEY dvi entry supports up to 4,096 native DVI pixels, for example 64x64 pixels. ▪ MADRIX KEY dvi supports up to 307,200 native DVI pixels, for example 640x480 pixels. ▪ MADRIX KEY professional supports up to 786,432 native DVI pixels, for example 1024x768 pixels. ▪ MADRIX KEY ultimate supports up to 1,310,720 native DVI pixels, for example 1280x1024 pixels. ▪ Stretching and scaling to higher resolutions is possible with all these products. ▪ Please pay attention to other restricting factors, such as hardware limitations. ▪ If you do not connect a MADRIX KEY or a MADRIX interface to your computer, MADRIX will run in demo mode. ▪ In demo mode, every single feature will be available to you. MADRIX even sends output data [such as DMX512, Art-Net, etc. ]; only the data output will be deactivated after each minute for a short period. - DVI output is overlaid by a colorful, rotating grid/cross. - You can see "NO MADRIX KEY". - The data output fully stops after 1 hour. You will need to restart the software to send restricted data again. When using DVI output, make sure to configure the graphic card outputs in Windows first! - Click Detect to search for undetected outputs. ▪ Resolution - Defines the pixel resolution of this output port. Make sure to configure your virtual LED matrix in MADRIX before using DVI output. Configuration of the virtual LED matrix is a requirement! You can use the Matrix Generator or the more advanced Patch Editor for this task. MADRIX features 2 DVI outputs. ▪ DVI - Activates a floating, borderless DVI window. This is the most important DVI output. It is especially useful when using on-screen capturing. A well know example is the software LED Studio, which uses screen capturing. ▪ Window - Opens a floating window with a border. This might be a useful option if you choose to use DVI output as an additional preview window. ▪ Full Screen - Enables a floating, borderless full screen window to fit the entire output device. This is particularly useful for output devices, such as projectors, beamers, monitors, and large TV screens. ▪ Often, 1 DVI output will be enough for your LED project. But in certain cases you might need 2 DVI outputs [for example when your DVI video processor needs 2 inputs to drive a large number of pixels]. ▪ If you do not need the second DVI output, you may simply use it as another preview window or not use it at all. 3] Configure External Window Settings. Each of the DVI outputs has a context menu. This menu makes various options available to you for External Preview 1 and External Preview 2, respectively. Note: Should an option be grayed out, it is not available at this moment or for this particular DVI output. ▪ DVI - Is explained above. ▪ Window - Is explained above. ▪ Full Screen - Is explained above. ▪ Lock Position - Locks the DVI output to the current position. It cannot be moved around with the mouse anymore. You can still change the position in the External Window Settings. ▪ Keep Always On Top - Brings the DVI output in front of all other windows at all times. No other window will overlap the DVI output. ▪ 2D Mode - Activates the 2D mode for the output. This is the default mode. ▪ Close - Closes the DVI output. External Preview Settings are an important part of the DVI output configuration! - The coordinate system used for this starts with 0,0 at the top left of the entire screen/monitor. In this way, Left: defines the X coordinate and Top: represents the Y coordinate. - Valid values range from -10,000 to 10,000. - Activate Use Display Area Size to set the size of the window to the settings of Display Area, which determines what is shown of your matrix. - Using different values for Width and Height than the maximum size of the Display Area will stretch or compress the content [you can make the window size smaller or bigger, but the pixel resolution will stay the same resulting in an image that is stretched or compressed. - The pixel resolution is set using the »Matrix Generator or »Patch Editor]. ▪ Display Area - Defines what is shown in the DVI ouput. 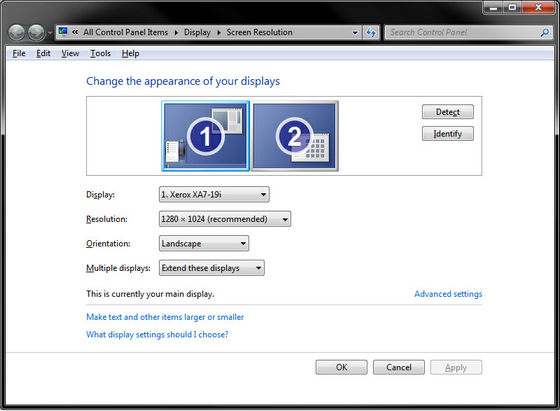 This option is available for all 3 DVI output modes. - Activate Use Full Size and your complete LED matrix will be displayed. Or you can select a certain cut-out and specify which details of your matrix will be shown. You can choose the start coordinates and the end coordinates of this area. - Left and Top define the start coordinates in a coordinate system that starts with 0,0 in the top left corner. For example, for the default matrix with 50x50 pixels, Left and Top are 0 by default and Right and Bottom are 49, by default. - Right and Bottom define the end coordinates. The end coordinates cannot be higher than the full size of the matrix. For example, for the default matrix with 50x50 pixels, Left and Top are 0 by default and Right and Bottom are 49, by default. ▪ Display Transformation - Allows you to flip or rotate the DVI output. This option is available for all 3 DVI output modes. - None does not flip the output, Flip H flips it horizontally, Flip V flips it vertically, Flip HV flips it horizontally and vertically. - Rotate the output by 0° degrees [no rotation], 90° degrees, 180° degrees, or 270° degrees clock-wise. This rotation applies to the Display Area. ▪ Click Apply to confirm your changes. Click OK to close the window. - If you have set up custom settings, MADRIX will show a check mark in front of External Window Settings... in the menu. ▪ The chapters »Patch Editor and »DVI Patch already explained that DVI-based fixtures are often used in combination with a DVI controller. Such a DVI controller might require to receive the incoming single in a specific way to receive the correct image on the LEDs. This is true for 2D and controlling a 3D project adds further complexity. ▪ DVI controllers usually do not accept any 3D input image. That is why, you will often need to send a 2D signal to the DVI controller, even though your project might be in 3D. ▪ MADRIX can create Slices to produce such a 2D signal for 3D projects. ▪ By default, each Z-level is placed beside the previous Z-level from left to right. ▪ You can change the Slice Alignment for DVI, Window, as well as Full Screen. ▪ The following example was chosen to explain Slice Alignment and 3D mapping for DVI. ▪ A virtual LED matrix of 15x8x3 is used. ▪ The first Z-level is the brightest, while the second and third Z-level have their Opacity increasingly reduced. ▪ A color gradient is applied as lighting effect. ▪ X-Slices - MADRIX produces slices along the X-axis. Since X = 15 regarding the virtual LED matrix in the example above, 15 slices are produced below. Above, Default View: Left can be used to imagine the different slices from the front to the back. ▪ Y-Slices - MADRIX produces slices along the Y-axis. Since X = 8 regarding the virtual LED matrix in the example above, 8 slices are produced below. Above, Default View: Top can be used to imagine the different slices from the front to the back. ▪ Z-Slices - MADRIX produces slices along the Z-axis. Since X = 3 regarding the virtual LED matrix in the example above, 3 slices are produced below. Above, Default View: Front can be used to imagine the different slices from the front to the back. ▪ Z-Slices / Left To Right is the default setting. ▪ Each DVI Output is a Preview at the same time. That means you have various options to work with them as DVI output or Preview. ▪ This manual includes additional examples on how to set up DVI output. You may want to send your Full Screen DVI output to another screen that is not the one you are using MADRIX on. This could be a second monitor or a projector, for example. ▪ Use the keyboard shortcut Alt+Tab to switch to the Full Screen Output. ▪ Use the Alt+Tab again to switch back to the MADRIX user interface. ▪ Make sure to select the full screen DVI output with your mouse [left mouse click]. ▪ Press the Tabulator key [Tab] on your keyboard to simply move the full screen window to an additional monitor or beamer. ▪ In this way you can use the Full Screen mode to completely visualize effects on your second monitor or output device, while you are working with MADRIX on your first screen. 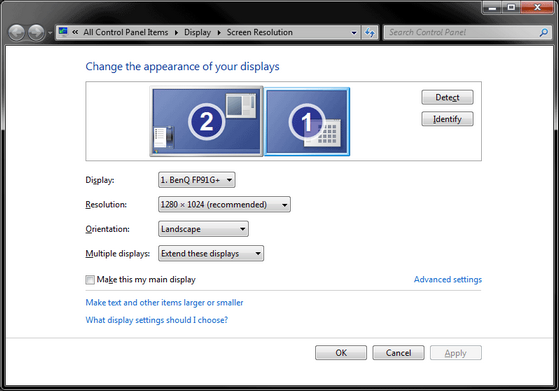 You must install and configure your graphics card and monitors correctly in Windows first to use this feature! You can upscale or downscale the DVI Output. That means you can increase or decrease its size without changing the native pixel resolution [as defined in the Matrix Generator or Patch Editor]. ▪ Activate a DVI output as described above. ▪ Set up Width as well as Height according to your requirements. - Use larger values to upscale the output. - Use smaller values to downscale the output. ▪ It is recommended to use multiples of the native pixel resolution [in order to not stretch the output]. - Example: Your virtual LED matrix might have a pixel resolution of 50x50 pixels. Enter 25x25 or 100x100 to use multiples of that resolution. ▪ Upscaling requires less performance than using a native pixel resolution but negatively affects the image quality in most cases. Further settings are available in the MADRIX Options.